Hay, best known as the frontman for Australian hit makers Men at Work, has received renewed acclaim for his troubadour-style solo career with the release of his acclaimed new album, Fierce Mercy. Fierce Mercy, Hay’s 13th solo album, was recorded in Los Angeles and Nashville and mixed by Vance Powell (Chris Stapleton, Jack White) and Gordon Hammond (Buddy Miller, Don Williams). The album explores themes of love and loss, mortality, and even the odd UFO sighting, but always with the singular perspective and insight that define Hay’s work. Colin returns to Australia with his US Band – on guitar, tres and vocals, Cuban, San Miguel Perez, with fellow Cuban Yosmel Montejo on bass and vocals – Scheila Gonzalez on keyboard, flute, sax and vocals – Cecilia Noel, percussion and vocals – and Jimmy Branly on drums. This smorgasbord of international flavours, added to Men at Work and Colin Hay songs, will delight audiences with Latin infused rhythms and sweet harmonies. 2016 was something of a breakout year for this career artist and included performances on The Tonight Show With Jimmy Fallon, Jimmy Kimmel Live! and ABC’s Greatest Hits; sharing the stage with Of Monsters and Men, Milk Carton Kids, Choir Choir Choir!, Kings of Leon; being publicly cited as an influence by artists as distinct as James Hetfield (Metallica), Jeremiah Fraites (The Lumineers), Troy Sanders (Mastodon) and The Infamous Stringdusters; as well as the completion of a documentary film about his career entitled Waiting for My Real Life, named for one of his best known solo recordings. Now finding himself in the unprecedented place of having both ’80s fame and indie credibility, it’s possible that Hay has delivered the defining album of his solo career with Fierce Mercy. General public tickets go on sale at 10.00am local times, Monday, 9 October 2017. 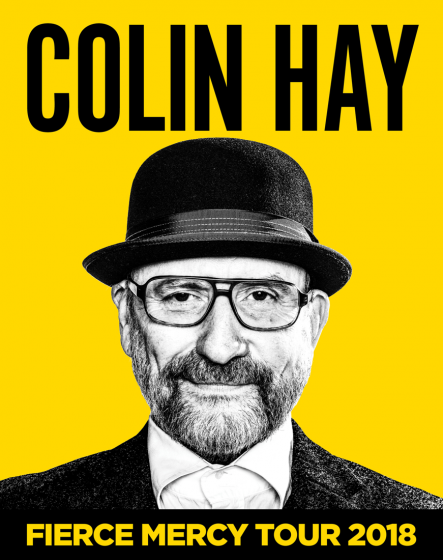 On Friday, 6 October exclusive pre-sales for Colin Hay fan club members and venue Ticketmaster / Ticketek members will begin at 10.00am and 12 noon respectively.